What Shots Help and Which Can Be Dangerous When You Have Cancer? 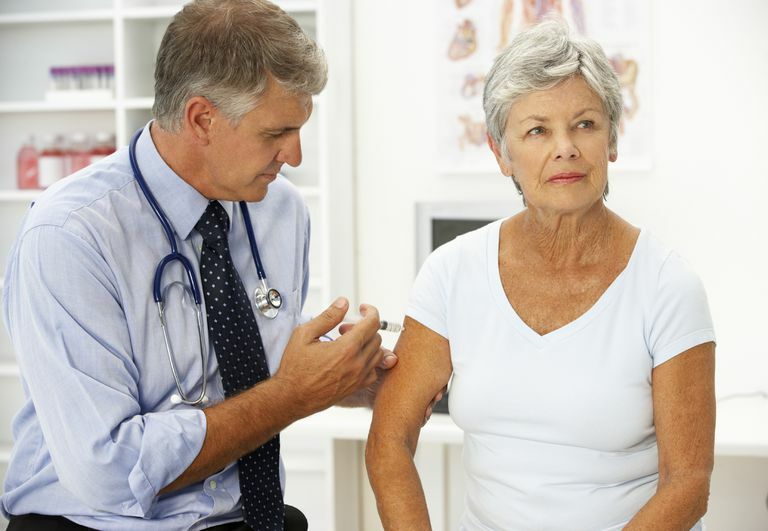 What immunizations should you get, and which should you avoid, while living with cancer? If you think about it for a while, it's easy to get confused. Are you more at risk from the vaccine or from the infection the vaccine might prevent? What do you do if you're exposed to an infection? Are you at risk if your child or grandchild gets her shots? Thankfully we do have good information to make those decisions less painful. There are some shots you should avoid. There are some that are highly recommended. And, for those going through cancer treatment, there's a better time and a worse time in which to get those shots that are recommended. Let's look at the best timing for shots as well as the answers to the questions we just asked. At the risk of sounding like a mother, let's start by talking about the shots that could be risky. There are some immunizations that you should never get during cancer treatment—at least treatment with chemotherapy, or when you are otherwise immunosuppressed. To understand this it helps to talk about the 2 different forms of immunizations, and how shots work. Immunizations essentially work to "trick" the body into seeing a disease-causing organism, so when that virus or bacteria actually appears, you have an army ready and willing to fight it. It can take a while to mount an immune response if your body hasn't seen an organism before, so the purpose of vaccines is to prime your body for a rapid attack on these diseases. There are 2 ways vaccines can expose your body to something that closely resembles the disease. Live vaccines consist of a weakened (attenuated) virus or bacteria. The reason for using a live vaccine is that it prepares the body better—it's more natural—should you ever be exposed to the real infectious agent, and the vaccine usually lasts for a lifetime. Contact With Someone Who Received Live Vaccines - There has been a lot of concern about whether people who are undergoing cancer treatment are at risk of exposure by, say, a grandchild being immunized with a live virus vaccine. The theory is that viral shedding by the recipient of the vaccine could pose a risk. Except for oral polio and smallpox (immunizations given rarely) which can be dangerous, this has not proved to be a significant problem, with only five documented cases of transmission via shedding out of 55 million doses. It's important to talk to your oncologist about any special precautions you take if your loved ones receive live vaccines. Going through cancer treatment you may be worried about getting a vaccine when you have a low white blood cell count, but think again. That same low white count could make you more likely to develop a serious or life-threatening infection from the illness the immunization is designed to prevent. Most people can receive a flu shot during treatment for cancer, though there are best times and perhaps best forms listed below. If you're going through cancer treatment it's also very important to know what to do if you are exposed to the flu, and what to do if you develop symptoms. Keep in mind that with the flu, it's often the secondary infections—those that arise after being ill with the flu—that cause the most problems. It's estimated that in 2015 in the United States alone nearly 200,000 people were hospitalized with infections that began with the flu. We don't know if people with cancer are more prone to developing the flu, but we do know that the mortality rate among cancer patients who contract the flu is high. Flumist - As noted above, the nasal spray flu vaccine should be avoided during cancer treatment as it is a live attenuated virus. The intradermal flu shot, one given just under the skin with a short needle, was approved in 2011 for healthy adults aged 18 to 64. Since it is designed for people who are healthy, it may not be the best choice for those living with cancer. Based on studies to date, the best treatment may be the high dose flu shot which is ordinarily recommended for older people who have immune systems that are not functioning as well as younger people. In studies, it was found that seroconversion rates—the vaccine stimulating the formation of antibodies—were better with the high dose vaccine, but the seroprotection rates—the vaccine protecting people from the disease—was the same as with the traditional flu shot. Since this is an active area of research, it's important to talk to your doctor about recommendations at this time. It's hard to talk about the best time for a flu shot in relation to cancer treatment as everyone is different and there are many variables. Talk to your oncologist about what is best for you. It's usually recommended that these shots be given at a time when your blood counts are expected to be at their highest, and this can vary depending upon the particular chemotherapy drugs and regimen you are receiving. As noted above, there are 2 variables that are important to consider. One is the risk of feeling ill with the shot. The other is that when your immune system is not functioning properly, the vaccine may not be effective in creating immunity. For people who are given steroids (alone and for chemotherapy side effects), there may be an increased risk from the flu vaccine, and probably no benefit. Some studies have found that patients treated with some cancer drugs—for example, rituximab, a form of targeted therapy—did not respond to the flu shot. For those who have a stem cell transplant or bone marrow transplant, it's recommended that they wait at least 6 months before receiving the flu vaccine, and perhaps longer in individual cases. If you've been exposed to someone with the flu, or if you develop symptoms of the flu, call your oncologist right away. There are medications available that may help decrease the severity of the flu but they need to be started as soon as possible to be effective. Keep in mind that if you've had your flu shot it usually takes at least 2 weeks before it will be effective in preventing the flu. Not only can the flu be dangerous if your immune system is challenged due to treatment, but becoming ill with the flu could also result in a delay in your treatment. Pneumonia is the number one cause of vaccine-preventable death in the United States, and one of the top 10 causes of death. Add to that the reduced immune function that can go with cancer treatment, and preventing this disease is a high priority. Prevnar -PCV13 - Recommended for children before the age of 2. If you have received the PPSV23 vaccine but not the PCV13 vaccine you should receive the PCV13 vaccine, followed by any remaining recommended doses of PPSV23. The concern, as with the flu shot is the timing, as the vaccine is less effective in people going through chemotherapy. According to one source, the ideal time is two weeks prior to beginning chemotherapy, and otherwise three months after completing treatment, but this can vary considerably depending upon the particular cancer treatments you will be receiving. Talk to your doctor about the best time to receive these immunizations. In special circumstances, you may need to consider one of the other killed vaccines such as the rabies vaccine. If this occurs, talk to your doctor about the risks and benefits as well as the optimal timing with your treatment. Preventing infections is a concern during cancer treatment, and it's important to remember that there are many infections for which we don't have vaccines. Thankfully taking a few precautions can significantly lower your risk. Check out these 10 tips to prevent infections. When you are going through cancer treatment, it's also helpful to be aware of hospital-acquired infections. Check out these ​tips for preventing hospital-acquired infections to avoid being one of the 1.7 million Americans who are affected by these infections each year. And if you're scratching your head wondering why you've been asked a dozen times if you have MRSA, learn about what a MRSA infection really is. Eliakim-Raz, N., Vinograd, I., Zalmanovici-Trestioreanu, A., Leibovici, L., and M. Paul. Influenza vaccines in immunosuppressed adults with cancer. Cochrane Database of Systematic Reviews. 2013. 10:CD008983. Jamshed, S., Walsh, E., Dimitroff, L., Santelli, J., and A. Falsey. Improved immunogenicity of high-dose influenza vaccine compared to standard-dose influenza vaccine in adult oncology patients younger than 65 years receiving chemotherapy: A pilot randomized clinical trial. Vaccine. 2015 Dec 22. (Epub ahead of print). Tai, L. et al. Perioperative influenza vaccination reduces postoperative metastatic disease by reversing surgery-induced dysfunction in natural killer cells. Clinical Cancer Research. 2013. 19(18):5104-15. Toleman, M., Herbert, K., McCarthy, N., and D. Church. Vaccination of chemotherapy patients – effects of guideline implementation. Supportive Care in Cancer. 2015 Nov 26. (Epub ahead of print). Vinograd, I. et al. Clinical effectiveness of seasonal influenza vaccine among adult cancer patients. Cancer. 2013. 119(22):4028-35.